Send the very best fruit gifts. 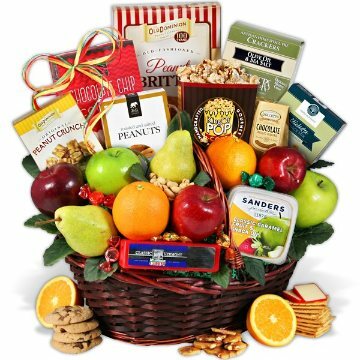 Brimming with a combination of award-winning fruits and gourmet foods, this fruit basket is one of our hallmark designs. Inside they’ll find a wonderful selection of orchard fresh apples, succulent pears and juicy navel oranges. Then we add crisp peanut brittle, sharp Vermont cheddar cheese, crackers, summer sausage, tangy mustard, incredible jams, fresh roasted mixed nuts, harvest granola, and chocolate covered dried fruits. For dessert or fruit dipping, you'll also find a delectable caramel dip and incredible chocolate chip cookies! Trust this design to tastefully convey any of your sentiments.